I am not much of a baker. I was recently contacted by the MOD as my biscuits could serve as an eco-friendly alternative to anti-tank munitions. 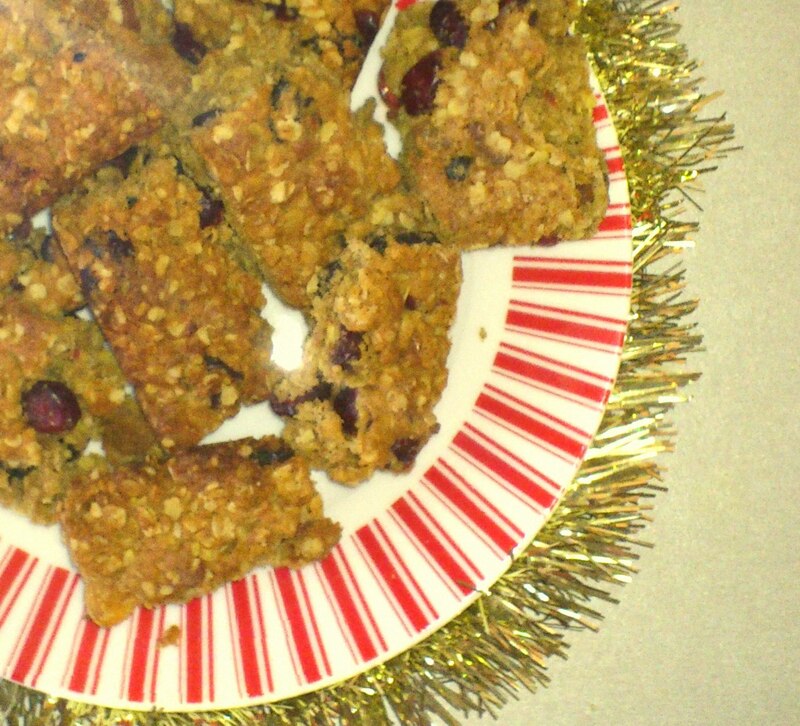 However, I do have a very easy recipe for flapjacks, which I have modified for the Christmas season. 4oz of mixed dried fruit – I use a mix of chopped apricots, chopped dates, cranberries and sultanas. Mix the oats, flour, dried fruit and spices in a bowl. In a pan, add the butter, sugar and syrup. Melt it over a low heat, stirring all the while. Add the bicarb of soda – it might foam a little. Add the melted butter mixture to the dry ingredients and mix thoroughly. Pack the mixture into a square cake tin, patting down firmly and ensuring it is level. Cook in an oven that has been preheated to 175 deg C for 12-15 minutes. After taking it out of the oven, allow it to cool for 30 mins before taking it out of the tin and cutting it into squares. Mother of 2, married to a Sales Manager. Breastfeeding peer supporter, interested in environmental issues. Breastfeeding, cloth nappying, occasional baby wearing mama who believes in benign neglect but doesn't believe in cry-it-out. I spent 10 years working in waste management, specifically with hazardous chemical waste. Fan of science fiction, Star Trek, Battlestar Galatica, anything by Joss Whedon. Very odd. Has written poetry but not attempted to publish. Will not admit to writing fan fiction. Oh no, that wasn't me.